Last week Dominic visited Nettlecombe Court to see the Loosemore/Crabb organ. These front pipes date from 1665, prodigious examples of the craftsmanship of the early modern West Country. The patterns are pressed into the metal, crisp and bold. 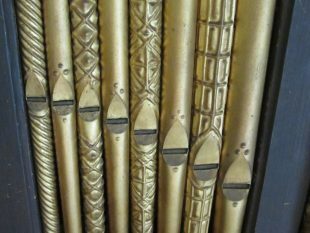 There are nine patterns in a 4ft front with 35 pipes. The intermediate pipes might have been painted with leaf patterns in 1665. They were re-gilded in 1835.